Following an injury to Dongfeng Race Team navigator Pascal Bidegorry, the Chinese-flagged entry in the Volvo Ocean Race has called up Franck Cammas, one of the stars of French sailing. The skipper of the recent French America’s Cup campaign – Groupama Team France - and a former Volvo Ocean Race winner as skipper of Groupama 4 in the 2011-12 edition - Cammas is standing in at the last minute as replacement for Bidegorry who sustained a rib injury on Leg 3. Cammas, aged 45 from Lorient in Brittany, will sail as navigator on board Dongfeng alongside skipper Charles Caudrelier, one of his closest friends in professional sailing and a former crew member on Groupama in the 2011-12 campaign. Caudrelier is looking forward to welcoming to the team the former Jules Verne record-holder, Solitaire du Figaro champion and three-time winner of the Transat Jacques Vabre who is renowned for his hard-driving perfectionism and skill at getting the best out of a boat. “Franck is joining the crew because of Pascal’s injury, which is not good news for us because Pascal has been a key element of the team since the beginning,” said Caudrelier. “Franck was available and he was ready as a back-up – we had already spoken about his wish to participate if he could help. “Of course Franck is a guy I have sailed with over the last 20 years – we are really like brothers – we have always been successful together and sailing with him has always been a pleasure for me and I completely trust him. Cammas scrambled at 12 hours notice to get to Melbourne from his home in France and will arrive tomorrow afternoon local time as Dongfeng Race Team prepares for the start of Leg 4 from Melbourne to Hong Kong on Tuesday. “I am very motivated to do a leg of the Volvo Ocean Race and it is obviously with Dongfeng that I feel most at ease, culturally and in terms of the people on board,” he said. “Replacing Pascal is a big challenge for me. With Charles, he has shared a lot and, as on the previous edition of this race, he and Charles have drawn some beautiful courses and made some wise choices. This necessarily puts a little pressure on me. Bruno Dubois, the Dongfeng Race Team director, emphasised that Cammas was always an option. “Charles and myself have been working with Franck for a while and it was always the plan that he would be a back-up if we needed him,” he said. 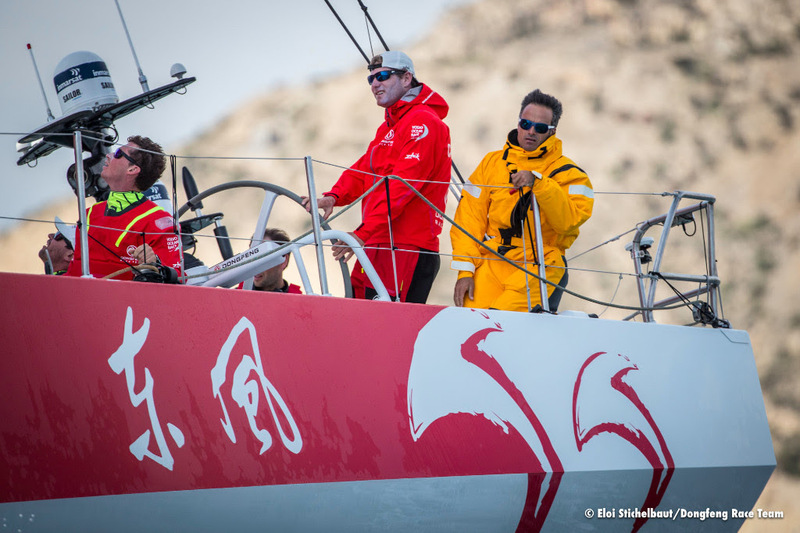 Neil Maclean-Martin the Dongfeng Race Team human performance manager, said Bidegorry’s injury will take time to heal. “Pascal sustained an injury to the joint between one of his ribs and the sternum when a wave hit the cockpit and he fell against the supporting bar of the wheel,” he said. Dongfeng Race Team currently lies second overall in the Volvo Ocean Race after finishing Leg 1 from Alicante to Lisbon in third place and then both Leg 2, from Lisbon to Cape Town, and Leg 3, from Cape Town to Melbourne in second place. The team is six points behind race leaders MAPFRE, skippered by Xabi Fernandez. This is Dongfeng Race Team’s second Volvo Ocean Race campaign. In 2014-15 it finished third overall, also under Caudrelier’s leadership. The team is wholly sponsored by the Chinese car and truck manufacturer, Dongfeng Motor Corporation. Apart from challenging for overall honours in the race, Dongfeng Race Team is also committed to helping to grow the sport of offshore ocean racing in China.